Clifford sets up a vehicle on our new alignment machine. Our lifts can handle cars, trucks, buses and RVs. Thank you for your interest in working for the Cherokee Boys Club, Inc. or one of our contract services departments. If you would like to be considered for employment, please print out and fully complete the attached job application. Completed applications must be delivered to our Administration Receptionist at our main campus between the hours of 8am-4:30 PM Monday-Friday– before the job closing period. Applications turned in after the deadline may not be accepted. Tip: attach your resume to the job application and job description. 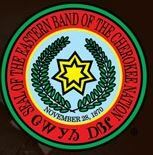 Job announcements are made weekly in the printed version of the local newspaper Cherokee One Feather and our FaceBook page at https://www.facebook.com/cherokeeboysclub/. Applications and job descriptions can be picked up at our main office across from the Cherokee Life Center at the Ginger Lynn Welch Complex. If you have a question about a job that is being advertised, please contact us at 828-497-9101.